Eduardo Abel Ramos: LOS TRABAJADORES DE LA SANIDAD FESTEJAMOS NUESTRO DIA CON OBRAS. LOS TRABAJADORES DE LA SANIDAD FESTEJAMOS NUESTRO DIA CON OBRAS. CADA 21 DE SETIEMBRE, LOS TRABAJADORES DE LA SANIDAD, TENEMOS LA DICHA DE CELEBRAR NUESTRO DIA CON LA CONCRECION DE UNA OBRA PROMETIDA. A PARTIR DE HOY LOS AFILIADOS DEL DEPARTAMENTO DE ANTA PODRAN CONTAR CON UNA FLAMANTE SEDE EN LA LOCALIDAD DE JOAQUIN V. GONZALEZ, INTEGRANDOSE DE ESTA MANERA AL RESTO DE LAS LOCALIDADES QUE YA CUENTAN CON SEDE PROPIA Y CON LOS MISMOS BENEFICIOS QUE USUFRUCTUAN LOS AFILIADOS DE SALTA CAPITAL.DEBEMOS TENER PRESENTEQUE A ESTA SITUACION SE LLEGA CON EL ESFUERZO Y EL SACRIFICIO DE CADA UNOS DE NUESTROS AFILIADOS Y CON LA CORRECTA ADMINISTRACION DE UNA CONDUCCION QUE DESDE EL PRIMER DIA DE SU GESTION, SE PROPUSO CONVERTIR A LA ASOCIACION ARGENTINA DE LA SANIDAD EN UNO DE LOS GREMIOS MAS IMPORTANTES DE NOROESTE ARGENTINO. PENSANDO EN EL TRABAJADOR Y AL MISMO TIEMPO EN SU FAMILIA. SOMO CONOCEDORES QUE A NIVEL MUNDIAL LA CRISIS ECONOMICA DE HACE SENTIR NOTORIAMENTE, PERO ESO NO ES UN IMPEDIMENTO PARA SEGUIR CRECIENDO. PORQUE APOSTAMOS A LA EDUACION Y CAPACITACION DE NUESTROS AFILIADOS, QUE EN DEFINITIVA ES APOSTAR AL FUTURO. PORQUE GARANTIZAMOS SU SALUD, CON UN SISTEMA SOLIDARIO EN EL CUAL LOS QUE ESTAN SANOS APORTAN POR LOS QUE SE ENCUENTRAN ENFERMOS. PORQUE EL SERVICIO MUSTUALISTICO ESTA PRESENTE CUANDO MAS SE LO NECESITA. PORQUE EL INSTITUTO RAMOS CARRILLO ES FORMADOR DE VERDADEROS PROFESIONALES. PORQUE MARCAMOS CON FIRMEZA Y CONVICCION NUESTRA PRESENCIA EN LA DEFENSA DE LOS TRABAJADORES. PORQUE DEFINITIVAMENTE TOMAMOS CONCIENCIA QUE SIN TRABAJO Y SIN UNIDAD NO PUEDE HABER CRECIMIENTO. ESTE 21 DE SETIEMBRE RECIBIMOS CON MUCHASEXPECTATIVAS UN NUEVO ESTATUTO PARA LOS TRABAJADORES DE LA SALUD Y NADIE PODRA CUESTIONAR QUE ESTO ES LA MEJOR LEY DE SALUD DE LOS ULTIMOS 20 AÑOS, MERCED AL ESFUERZO DE EL ACTUAL GOBIERNO PROVICIAL. MAS ALLA QUE UN CIRCULO MINIMO DE OPORTUNISTAS HAYA INTENTADO TERGIVERSAR LA REALIDAD, INTENTANDO CONFUNDIR EL VERDADERO ALCANCE DE LA CARRERA SANITARIA CON LA URGENTE NECESIDAD DE UN INCREMENTO SALARIAL PARA LOS TRABAJADORES. 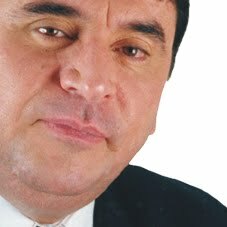 EL EXITO DE ESTA CONDUCCION SE BASA EN EL CONOCIEMIENTO CERTERO DE LA REALIDAD Y EN LA EXPERIENCIA QUE NOS PERMITE SABER LO QUE REALMENTE NECESITA EL TRABAJADOR. Y NUESTRO TRABAJADOR HOY NECESITA, PRIMERO, UNA LEY QUE LO ACOMPAÑE EN SUS TAREAS DIARIAS Y LO DIGNIFIQUE EN SU LUGAR DE TRABAJO. SEGUNDO, UN URGENTE INCREMENTO SALARIAL QUE NO LO HAGA SENTIR POSTERGADO. LA LEY DE LA CARRERA SANITARIA YA ES UNA REALIDAD, QUE NECESITA DE NUESTRA ACTIVA PARTICIPACION EN LA COMISION PERMANENTE DE CARRERAS; EN LA CUAL DEFENDEREMOS EL PROFESIONALISMO DE CADA UNO DE LOS INTEGRANTES DEL EQUIPO DE SALUD, EN PARTICULAR DE LOS ENFERMEROS Y LICENCIADOS EN ENFERMERIA. Y QUE SU ESPIRITU SE MANTIEN INALTERABLE EN EL CUIDADO Y LA ATENCION DE QUIEN MAS LO NECESITA...EL PACIENTE. FELICIDADES TRABAJADORES DE LA SANIDAD!! !.